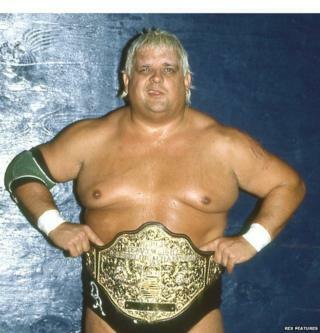 One of wrestling's most colourful stars, Dusty Rhodes, the self-styled "American Dream", has died aged 69. The death of Virgil Runnels, which was his real name, was announced by World Wrestling Entertainment (WWE). His long and glittering career, which began in the late 1960s, earned him a place in the WWE Hall of Fame. "Runnels became a hero to fans around the world thanks to his work ethic, his impassioned interviews and his indomitable spirit," said WWE. The statement went on to describe him as a "creative visionary who helped shape the landscape of WWE" long after his retirement from the ring. Tributes poured in for the Texan-born fighter, who won several world titles and became famous during the height of wrestling's popularity in the 1970s and 1980s. "Saddened to hear the passing of Dusty Rhodes. Legend, teacher, mentor, friend ... Love you Dream," said professional wrestler Paul Levesque, also known as Triple H.
"My mentor," tweeted Ric Flair. "Much love to your family and more respect than can ever be measured. Love you Dream." A WWE spokesman declined to give a cause of death or any details on where he died.